An Kaulangan amo an aspeto han tawo may deperensya ha pisikal nga panlawas, sugad han mga diri nakakalakat, ngan puydi liwat an mga may deperensya han panhunahuna. Donovan, Rich (March 1, 2012). "The Global Economics of Disability". Return on Disability. Ginkuhà August 11, 2012. Ducy, Elizabeth McAdams; Stough, Laura M.; Clark, M. Carolyn (2012). "Choosing Agency in the Midst of Vulnerability: Using Critical Disability Theory to Examine a Disaster Narrative". In Steinberg, Shirley R.; Cannella, Gaile S.. Choosing Agency in the Midst of Vulnerability: Using Critical Disability Theory to Examine a Disaster Narrative. New York: Peter Lang. ISBN 978-1-4331-0688-0. Nikora, Linda Waimari; Karapu, Rolinda; Hickey, Huhana; Te Awekotuku, Ngahuia (2004). "Disabled Maori and Disability Support Options". Maori & Psychology Research Unit, University of Waikato. Ginkuhà August 11, 2012. Stough, Laura M. (2009). "The Effects of Disaster on the Mental Health of Individuals With Disabilities". In Neria, Yuval; Galea, Sandro; Norris, Fran H.. The Effects of Disaster on the Mental Health of Individuals With Disabilities. Cambridge University Press. ISBN 978-1-107-41282-8. Yeo, Rebecca (2005). "Disability, poverty, and the new development agenda". Disability Knowledge and Research Programme. Ginkuhà June 19, 2013. Masala, Carmelo; Petretto, Donatella Rita (2008) (ha Italian). Psicologia dell'Handicap e della Riabilitazione. Rome: Kappa. ISBN 978-88-15-06226-0. Burch, Susan (July 2009). "(Extraordinary) Bodies of Knowledge: Recent Scholarship in American Disability History". OAH Magazine of History 23 (3): 29–34. ISSN 0882-228X. doi:10.1093/maghis/23.3.29. Kaushik, R. (1999). "Access Denied: Can we overcome disabling attitudes". Museum International (UNESCO) 51 (3): 48–52. ISSN 1468-0033. doi:10.1111/1468-0033.00217. Lansing, Michael J. (January 2009). "'Salvaging the Man Power of America': Conservation, Manhood, and Disabled Veterans during World War I". Environmental History 14: 32–57. ISSN 1084-5453. doi:10.1093/envhis/14.1.32. Longmore, Paul (July 2009). "Making Disability an Essential Part of American History". OAH Magazine of History 23 (3): 11–15. ISSN 0882-228X. doi:10.1093/maghis/23.3.11. Masala C, Petretto DR (2008). "From disablement to enablement: conceptual models of disability in the 20th century". 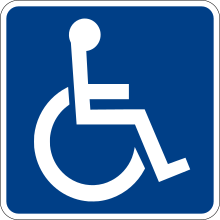 Disability and Rehabilitation 30 (17): 1233–1244. ISSN 0963-8288. PMID 18821191. doi:10.1080/09638280701602418. Ini nga pakli kataposan nga ginliwat dida han 11:15, 31 Enero 2015.